How much more awesome is Busy Philipps now that you know she's also a professional cake maker? Like, we would probably pay $50 for that cake, it looks better than a lot of Cake Boss' cakes, and he's an actual cake boss! It would be a shame if Philipps left the entertainment business because she's a constant delight, but if cakes are her dream, she should obviously get into the decoration game because girlfriend has SKILLZ. Let's commiserate over how we weren't at that party by sitting in our apartments and eating cake not made by Busy Philipps that isn't decorated with penguins. Actually, wait. If we're eating cake, we're all doing pretty OK. I take it back, life is fair and great! 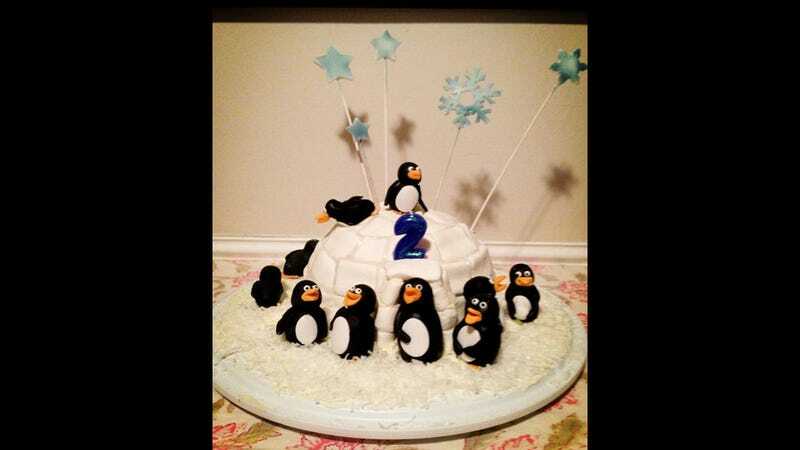 BTW, the penguin cake was for the daughter of the extremely talented cartoonists Damien Jay and Minty Lewis. In fact, Lewis' PS Comics compilation is one of my favorite books of all time, it's just the greatest and funniest best, and I'm no paid spokesperson! But you know who IS an unpaid spokesperson (or, er, giver of a book blurb)? THE JACK HANDEY. And when Jack Handey talks, I listen. Wonderfully whimsical, odd and dreamy. If you don't like talking fruit and talking animals, what are you, insane? When the man is right, the man is right.